Grew up…in the Southern Water Tribe, at the South Pole. Sokka’s mother was killed when he was young, and his father left to fight the Fire Nation when he was 13. Since then, Sokka has tried to act as a leader for the whole tribe, since he’s the oldest male. Taking care of his sister Katara, leading the tribe, and practicing his martial arts kept him pretty busy. Living… on the road. Recently, Sokka and Katara discovered a boy suspended in a glacier. In a flash of bright light, the boy emerged, and they found out that he was the Avatar, a powerful figure who had vanished a hundred years ago. 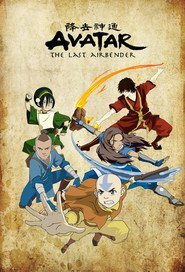 Aang, the Avatar, might look young, but he is destined to save the world. Now the three are on a journey to figure out exactly how to do that. Profession… teenage boy. Sokka might have acted as the leader of their tribe, and he tries hard to be a warrior, but at the end of the day he’s just a young guy, traveling with his sister and their friend. Interests… meat, fighting, and inventing. Since Sokka isn’t a bender, a person capable of manipulating elements, he tends to focus on science, and has created some astounding innovations. That is, when he’s not thinking about food. Relationship Status… single. Not for lack of trying, though. Challenge…helping Aang defeat the Fire Nation. Fire Nation soldiers killed Sokka’s mother, and now they’re trying to take over the entire world. If Sokka and others can help Aang learn all four elements of bending, he’ll hopefully be powerful enough to take on Fire Lord Ozai. Personality… funny, intelligent, and immature. Sokka is the comic relief of the group, often intentionally, sometimes unintentionally. He has the ability to be really insightful, but unfortunately lets his rashness and insistence on being right overcome him. He’s highly skeptical of bending and any other supernatural stuff. Sokka's popularity ranking on CharacTour is #713 out of 5,000+ characters. See our top-ranked characters and read their profiles.